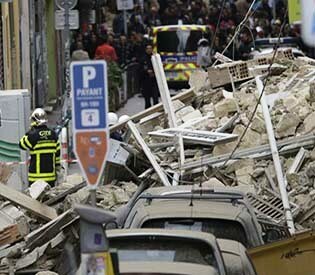 Two buildings collapsed in the southern city of Marseille on Monday, leaving a giant pile of rubble and beams. Fire services said two people were lightly hurt. The collapse spewed rubble into the street and clouds of dust into the air, and left a big gap where the two buildings used to be. Dozens of fire officers were at the scene, some with sniffer dogs, and thick dust covered cars in the street that is close to Marseille’s famous Old Port. Authorities said searches were underway for any victims trapped under the rubble. Marseille fire services tweeted that two people were treated for light injuries. Amateur video broadcast on BFM-TV showed clouds of dust in the street and bystanders covering their mouths with their sleeves. Images of the buildings before they collapsed, visible on Google Street View, showed that one used to have five floors and the other six. One of the buildings was clearly in poor repair, with boarded-up windows and large visible cracks on its facade before it collapsed. Sabine Bernasconi, the local mayor for that part of Marseille, said one of the buildings had been subject to an evacuation order, but she could not rule out that squatters might have been using it. The regional prefecture urged people to avoid the area and make way for the emergency services.